Lagos State Governor, Mr. Akinwunmi Ambode, on Thursday said if Nigeria must get out of the woods, it must begin now to take concrete steps towards empowering every group in the society and give ears to their views and aspirations, saying it is only in such situation that the country can truly end extreme poverty. Governor Ambode, who said this while delivering a paper to commemorate the 75th Anniversary Business Lecture of the Island Club, said Nigeria must aggressively pursue strong social inclusion policies in order to build a virile nation where every member of the society, regardless of their status or creed is catered for. Speaking on the topic ‘Nation Building: Communities, Inclusion and Prosperity’, the Governor said presently there were various indices that present a worrying picture, stressing that the country must address it by taking actions that would change the narrative and engender prosperity. “A sustainable path towards ending extreme poverty and promoting shared prosperity also involves creating an inclusive society, not only in terms of economic welfare but also in terms of the voice and empowerment of all groups. “We must begin to realise that every strata of the society counts, we must listen and accommodate all views, whether they are poor, whether they are Igbos, Hausas, whether they are Muslims or Christians. An inclusive society must have the institutions, structures and processes that empower local communities, professional associations, artisans, CDAs so they can hold government accountable. “It also requires the participation of all groups in society, including traditionally marginalised groups such as ethnic minorities and indigenous populations in decision making processes,” he said. Highlighting the Lagos example of inclusion and prosperity, Governor Ambode said his administration in the last three years, despite the population and migration challenges vis-a-vis pressure on physical and social infrastructure, has continued to carry out massive upgrade of its infrastructure, which according to him would have improve the lives of all residents and ultimately the economy. “We believe that every Lagosian must have the opportunity to grow, develop their own skills and contribute to their families and communities in a meaningful way. “If they are healthy, well educated and trained to enter the workforce and are able to make a decent wage, they are better equipped to meet their basic needs and be successful. Their families will also do well and the whole society will benefit. The aggregate sum of family well-being is the meat for nation building,” he said. The Governor said that his administration has concentrated on creating an environment for investments to thrive, saying that deliberate steps were also taken to encourage the private sector to take the front seat and grow the Gross Domestic Product (GDP) of the State. He listed development of Tourism, Hospitality, Arts, Sports and Entertainment sectors, development of an integrated and modern inter-modal transportation system, Employment Trust Fund, CodeLagos and Ready-Set-Work as some of the strategies evolved over the last three years that has recorded huge impact in the State’s economy. “Our Employment Trust Fund has disbursed N5.84billion to 7, 880 Lagosians out of which 1,123 have fully repaid their loans. This is a revolving fund that targets inclusion and prosperity. “Over 25,000 jobs were created through the loans and employability programmes and to ensure inclusion, 3,613 women recievedN2.29billion while N1.44billion was disbursed to individuals less than 35 years and at least N100million in each local government of the State,” Governor Ambode said. “In terms of inclusion and prosperity, our vision to make Lagos safer and more prosperous is driven by the need to foster and build an inclusive society, a Lagos that works for all of us. This has been our primary focus in the last three and half years. “This vision of making Lagos Africa’s model mega city and global economic and financial hub is reflected in everything that we have been doing, bringing our communities together to ensure the future prosperity of Lagos State is non negotiable. I am convinced that we are on the right trajectory and that’s the way to go if Lagos is going to show a very good example to the rest of the country,” he said. Recommending the way forward, Governor Ambode said to ensure inclusion and evolve prosperous communities; social policy needs to move beyond conventional social service approaches towards development’s goals of equitable opportunity and social justice. Expressing optimism that the Nigeria economy was showing positive indices of recovery and encouraging outlook for the future, the Governor, however, said economists had posited that for Nigeria to attain its potential, the economy needs to move at a growth rate of six to seven per cent per year as the population growth was above three per cent. “To meet our growth ambition, we need jobs and we need to increase productivity too. Nigeria has the advantage of a large population, but the majority are under-skilled. It is imperative to equip workers with the skills needed to keep pace with an economy in transition like Nigeria,” he said. “We need to close that in economic and political gap between women and men in this country. Providing both girls and boys with education is going to be our first step. Quality education is the basis for job and income, a modern competitive economy needs the best heads and hands regardless of gender. This is just sound economics and simple common sense. “Government needs to implement structural reforms to enhance efficiency, making valued long term investment in technology and science to support research and development. In addition, government also needs to support the economy to provide jobs for their fast growing job population,” Governor Ambode said. Earlier, Chairman of Island Club in his welcome address thanked Governor Ambode for his support to the Club since he assumed office, saying that he had not only followed the footsteps of his predecessors as Patron of the Club, but had on some occasions, moved a notch further than they did. Also speaking, a former chairman of the Club, Chief Olumuyiwa Falomo lauded the Governor for his developmental strides in the last three and half years, assuring him that history would be kind to him. “Only God knows the future, just carry on regardless, the reward of being very conscientious with what you do will come sooner than later and my prayer for you is that God will guide you and the sky will be your limit,” Falomo said. Highlight of the lecture was the launch of the anniversary brochure and the commissioning of the car park project initiated by the club. 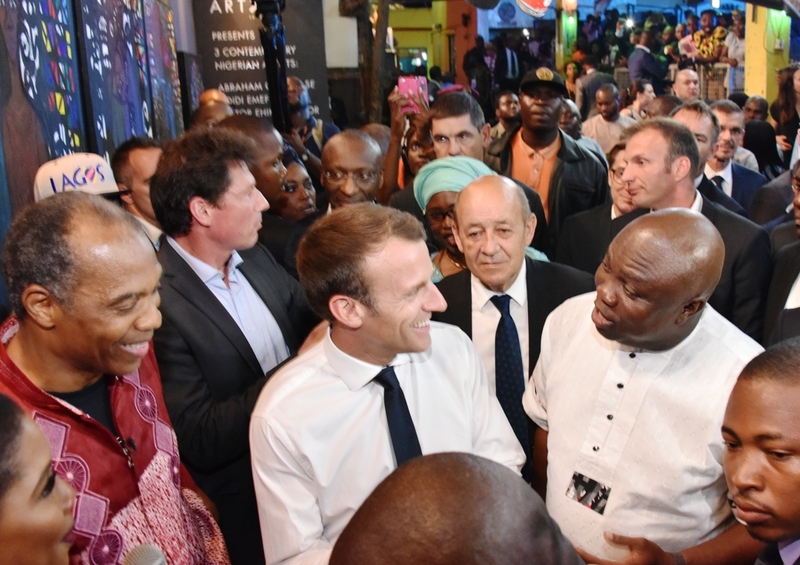 President of France, Mr. Emmanuel Macron on Tuesday night made a historic visit to the Afrika Shrine, home of the late Afrobeat legend, Fela Anikulapo Kuti, describing it as an iconic centre for the propagation of African culture, strength and music. 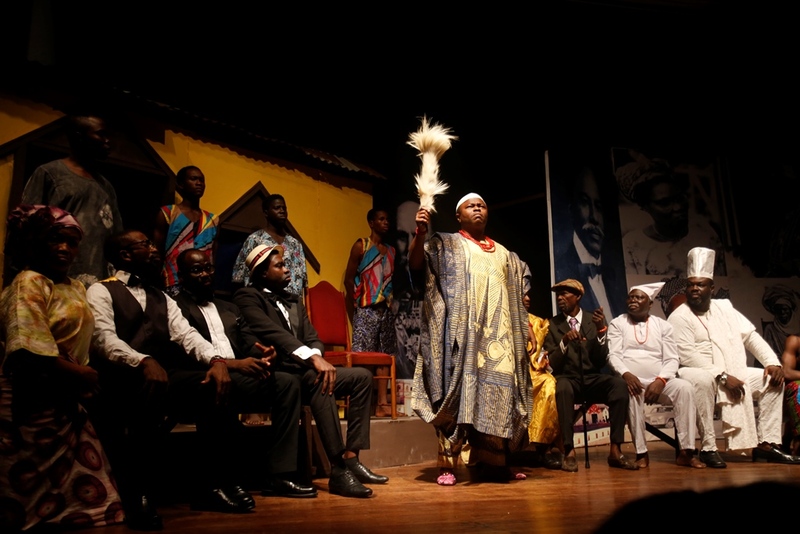 Macron, who spoke at the New Afrika Shrine in Agidingbi, Ikeja, Lagos, at an event tagged ‘Celebration of African Culture’ to inaugurate the African Cultural Season 2020, said he was glad to be back to the Afrika Shrine, adding that he still holds fond memories of the place since his first visit back in 2002. Lagos State Governor, Mr. Akinwunmi Ambode (right), with President of France, Mr. Emmanuel Macron (left) during the arrival of the French President at the Muritala Muhammed International Airport, Ikeja, Lagos, on Tuesday, July 3, 2018. “I discovered Nigeria and a lot of my friends are here. I discovered Nigeria and I discovered Lagos and I discovered the shrine. This place is an iconic place and it is a place where the best of music is given. I have to say my main memories about this place are friends, proud people, proud of their culture, proud of their art and music. I have a very different view of Africa than a lot of other people in Europe,” he said. Lagos State Governor, Mr. Akinwunmi Ambode, with President of France, Mr. Emmanuel Macron and Afrobeat musician, Femi Kuti (right) during the celebration of African Culture at the Afrika Shrine, Ikeja, Lagos, on Tuesday, July 3, 2018. 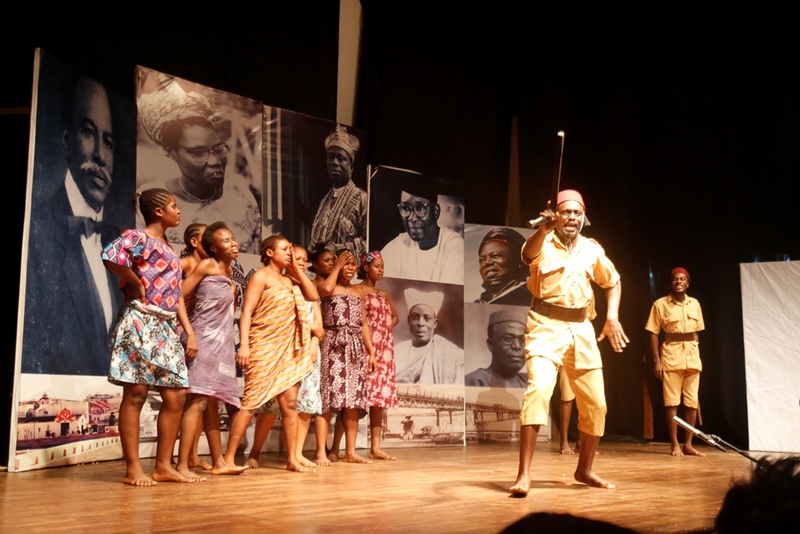 He also disclosed plans to host the African Cultural Season 2020 in France, which he said, would be about promoting African culture in Europe, adding that the event was going to be for Africa and by African artistes. “It will include people with fashion, African movies, new generation of artistes will be coming from Africa and it will be organized by them to show Europe and France” the real culture of Africa. “The event will be financed by African leaders. It will not be sponsored by France or European businesses, but by African businesses, it is brand new. This season is a unique one and it will be the new face of Africa in Europe organize by Africans, providing what you like and what you have here,” he said. 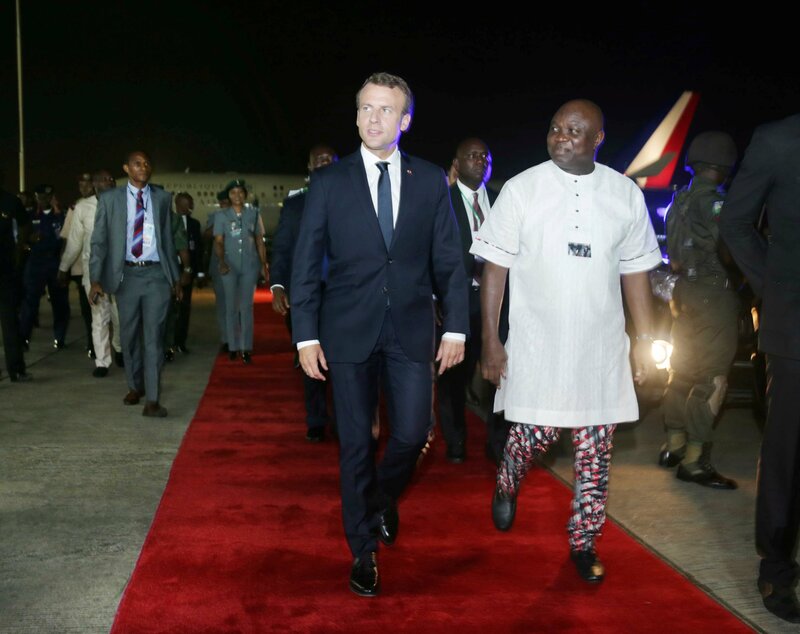 At the official unveiling of Alliance Francaise, a French Cultural Centre in Lagos on Wednesday, Macron said the development was part of the measures to scale up the relationship between France and Nigeria, while also specifically offering the commitment of the government and people of France to development of infrastructural projects in Lagos. “Thanks very much for being here; thanks very much for making this possible and to Mr Governor, we spoke yesterday and this morning together in the car. Going to shrine together yesterday and going to French Alliance now. It’s much more quite, much more calm and reasonable but at the end of the day, I think both of us (Governor Ambode and I) did share the same views that we can do tremendous things together. “Your State – Lagos, is one of the main challenges of not just Nigeria but the whole of Africa. I mean this huge city, there is tremendous challenge about how to make people living together in peace, in a better place and I want France to be part of this story and I do want my country and my people being part of this experience. It means belonging same values, sharing cultures, languages, literatures, music, movies, building together projects, having common economic projects and so on, and this eco system will be not just possible but stronger staying in this place,” Macron said. Earlier, Lagos State Governor, Mr. Akinwunmi Ambode while welcoming President Macron to the State, expressed optimism that the historic visit will go a long way to break any barriers between Nigeria and France as well as foster greater collaboration for economic, social and cultural growth. 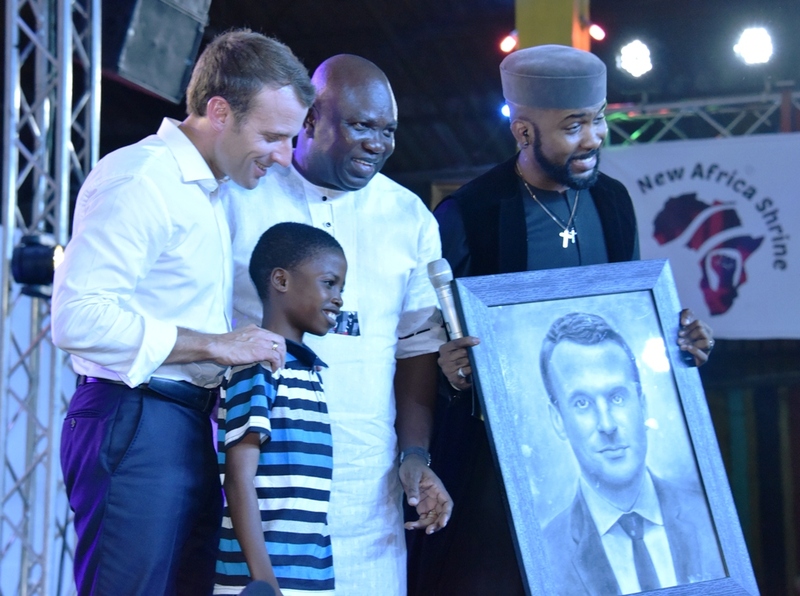 The Governor said the State Government was delighted to host Macron, a well respected global leader, adding that it would also signal a new era between both countries, especially for Lagos where talents in the arts and creative industry abound. “On behalf of the government and good people of Lagos State, I welcome His Excellency, President Emmanuel Macron, President of France, to the commercial and cultural capital of Nigeria and indeed West Africa. “We are delighted and honoured to be hosting a President of one of the world’s Super Powers; a permanent member of the United Nation’s Security Council with veto rights, a prominent member of the G8 and the World Trade Organisation and a champion of Global Climate Change. 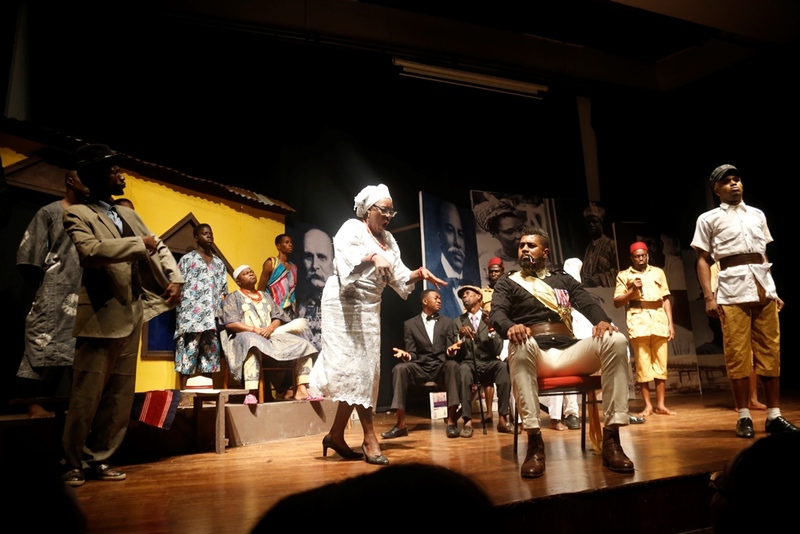 The Governor said he was particularly delighted that Macron’s visit to Lagos began on a cultural and entertainment note, adding that the French Cultural Centre and Alliance Française based in the State had always been an asset to its cultural landscape in the same way that Trace Television had also become an invaluable addition to its music and entertainment sphere. 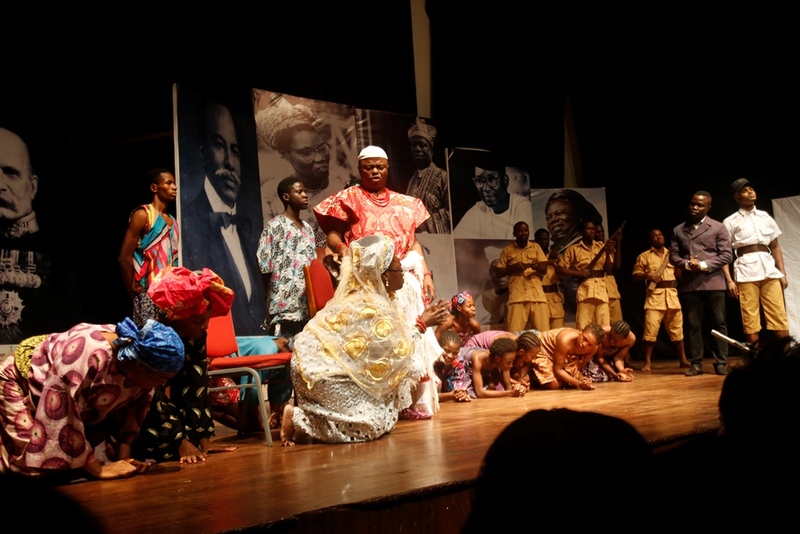 Governor Ambode said he was very optimistic Macron’s visit and activities would boost the State’s quest to become the culture and entertainment capital of Africa, just as he said that the State Government would seek to establish collaborations with France and play an integral part of the Year 2020 African Cultural Season in Paris as envisioned by President Macron. “With the exceptional characteristics of our State as the most populous, vibrant and indeed the fifth richest economy on the African continent, Lagos is the undeniable destination for business and pleasure in Africa. The new Lagos experience is being enhanced daily as we continue to create an enduring infrastructural and security architecture for the business of tourism and cultural arts to thrive. This also creates a platform for our local talents to feel a sense of belonging and encouragement. 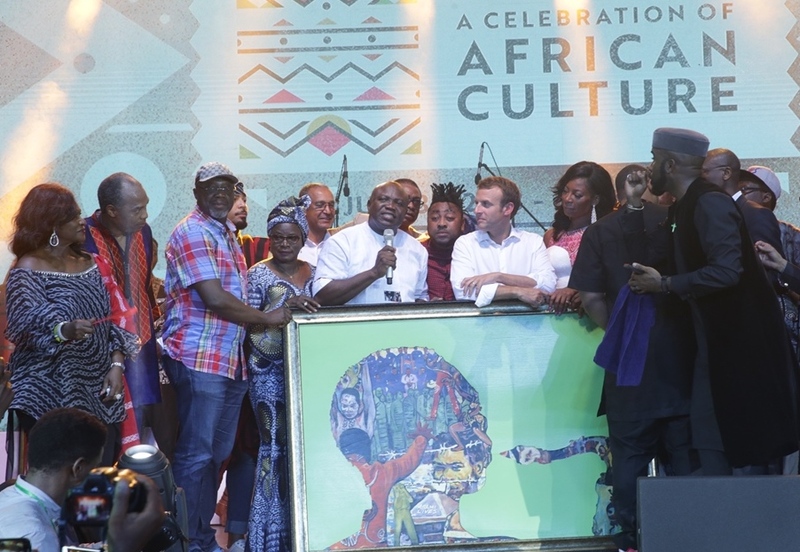 Lagos State Governor, Mr. Akinwunmi Ambode (4th left), presents an art painting to President of France, Mr. Emmanuel Macron (4th right) during the celebration of African Culture at the Afrika Shrine, Ikeja, Lagos, on Tuesday, July 3, 2018. With them: Grammy award-winning musician, Angelique Kidjo (4th left); Special Adviser to the Governor, Lagos Global, Prof. Ademola Abass (3rd left); Afrobeat mucisian, Femi Kuti (2nd left); Mrs. Yemisi Ransome-Kuti (left); Nigerian Music Act, Bankole Wellington ‘Banky W’ (right) and others. “Mr. President, this momentous State Visit shall signal the dawn of a new era between France and Nigeria especially for the myriad of talents that have made Lagos their home,” the Governor said. He said Macron’s emergence as the President of France has inspired many youths in Nigeria, who constitute 60 percent of the country’s population, adding that Lagos was providing avenues for youths to explore their creativity and talents. There were also Art Exhibition, Fashion Show, display of Nollywood scenes, presentation of a painting of Fela to Macron by Governor Ambode as well as pencil frame artwork of Macron done by 11-old old Kareem Olamilekan drawn within two hours. 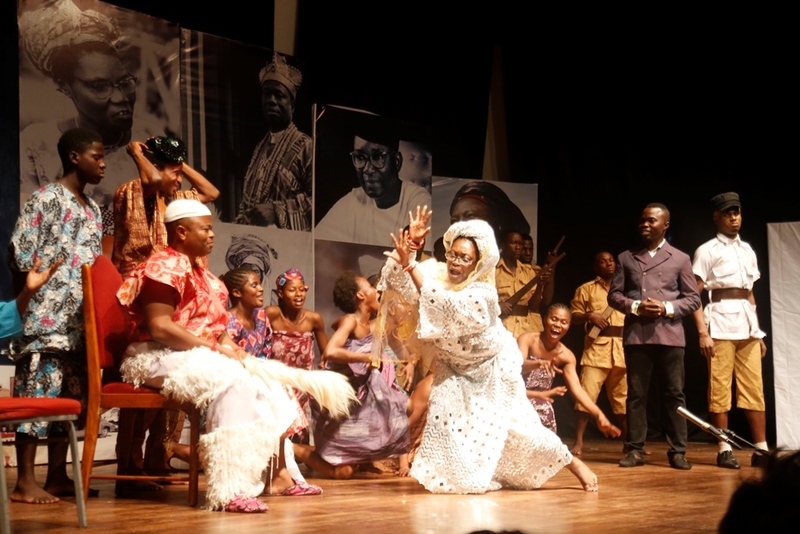 Highpoints of the night include sterling performances by dance group, Footprints of David, music artistes, Yemi Alade, Charlotte Dipanda from Kenya and a scintillating performance by Femi Kuti to bring the event to a close. Today is a special celebration of the anniversary of June 12. For us in Lagos State, where the struggle started, this year’s anniversary is a victory for democracy. We all recall that a historic event happened on this very day in 1993 when Chief Moshood Kasimawo Abiola stood as a candidate in a presidential election adjudged to be the freest, fairest and most credible in the history of our nation. It was a day Nigerians demonstrated unity and put aside ethnic and religious biases to speak overwhelmingly with one voice. Sadly, the aspiration of Nigerians expressed through the ballot was truncated by the military. Since then, the struggle for democracy has been relentless, championed by progressive Nigerians, men of character and courage who challenged the military junta. With the return of democracy in 1999, Lagos State, driven by our irrepressible and indefatigable leader, Asiwaju Bola Ahmed Tinubu, continued to celebrate June 12 and always recognize its importance in our democracy. Distinguished guests, ladies and gentlemen, you can imagine our delight when the President Muhammadu Buhari, GCFR, announced the recognition of June 12 as the authentic Democracy Day in Nigeria. This formal recognition is a crown of victory to the struggle that had taken the lives of so many nationalists and patriots. Not only was June 12 recognised, the symbol of the struggle, Chief Moshood Kashimawo Olawale Abiola is to be conferred posthumously with the highest national honour of Grand Commander of the Federal Republic [GCFR], his running mate, Ambassador Babagana Kingibe, Grand Commander of the Order of the Niger (GCON). By this singular act, including the award of the Grand Commander of the Order of the Niger on the fearless human Rights activists, Chief Gani Fawehinmi, President Muhammadu Buhari has written his name in Gold in the political history of Nigeria. We salute President Muhammadu Buhari for demonstrating exceptional courage to stand by justice and the truth. 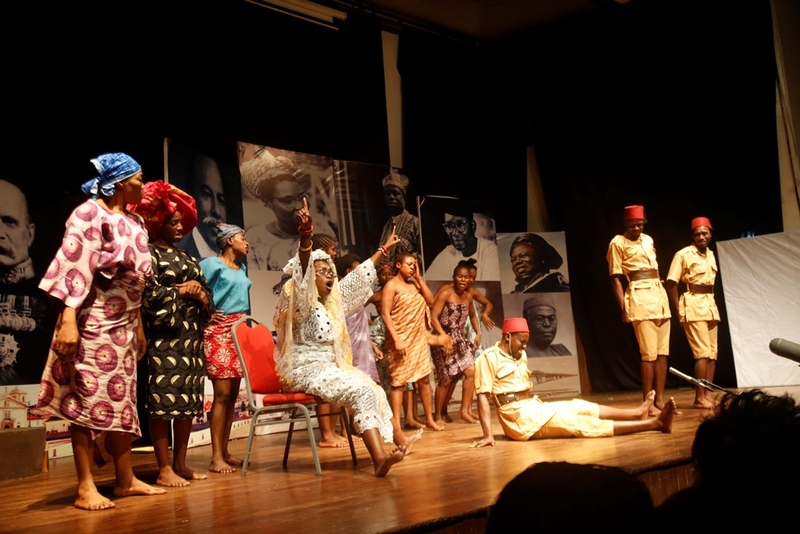 Today, we salute leaders of the struggle including Gen. Alani Akinrinade, Prof. Wole Soyinka, Ambassador Walter Carrington, Justice Dolapo Akinsanya, Chief Frank Kokori, Rear Admiral Ndubuisi Kanu, Mr. Wale Oshun, Alhaji Balarabe Musa and other Nigerians and Civil Society Organisations, Trade and Labour unions. 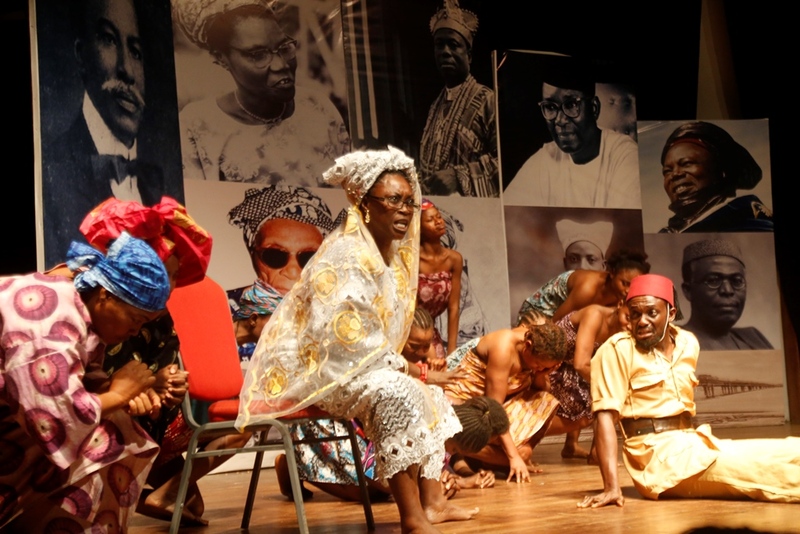 We also pay glowing tribute to the beautiful memories of patriots such as Alhaja Kudirat Abiola, Pa Michael Adekunle Ajasin, Pa Abraham Adesanya, Chief Michael Enahoro, Chief Alfred Rewane, Dr Beko Ransome Kuti, General Adeyinka Adebayo and several others including innocent ordinary Nigerians, young and old who were murdered in cold blood on the streets of Lagos and in other major cities of Nigeria. Today, we declare that their sacrifice has not been in vain. I reserve special recognition for my predecessors, Asiwaju Bola Ahmed Tinubu for his pioneering influence in declaring a public holiday on June 12 throughout his tenure in office, and Babatunde Raji Fashola (SAN) for his steadfastness in upholding this tradition. Today’s celebration lays credence to the fact that our leaders were visionary. Distinguished ladies and gentlemen, the theme of this historic edition of June 12 celebration, “Restructuring: Antidote for Ineffective & Ineffective Politics”, speaks for itself. As a State and people, our stand on a restructuring process that will lead to fiscal federalism, devolution of power is very clear. Our present democratic experience may still be far from ideal but we must all make concerted efforts to entrench fiscal federalism which is the only way to achieve true nationhood. We are absolutely convinced that it is the right way to go for us to realise the optimum potential and prosperity of the federating States and the nation. On this historic day, I am convinced more than ever before that this ideal will be realized sooner than we can imagine. I thank you all and wish all Lagosians happy June 12 victory celebrations. Itesiwaju Ipinle Eko, lo je wa logun! Your Royal Majesties, Kabiyesis and Chiefs. I am most delighted to be in your midst today as we inaugurate the newly constituted Lagos State Council of Obas and Chiefs. Let me start by expressing my sincere appreciation to the members of the dissolved Council under the Chairmanship of His Royal Majesty, Oba Riliwanu Babatunde Aremu Osuolale Akiolu 1, Oba of Lagos for serving the State with a high sense of patriotism during their five year tenure. This new council is being inaugurated at a time of momentous changes in the evolution of our State, especially with the development by our administration to ensure that every community feels government presence. 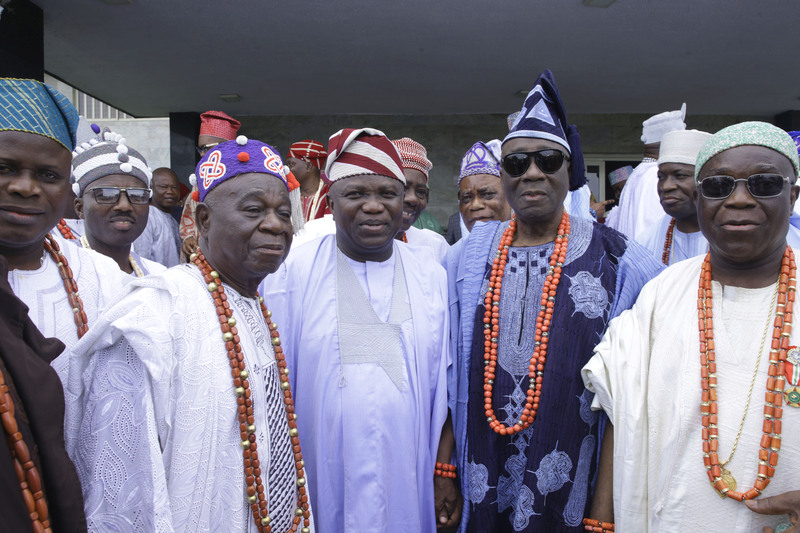 Our government has immense regard for our Royal Fathers and Traditional Rulers and we always welcome advice from our royal fathers in order to maintain social harmony and ensure peaceful coexistence in our State. I therefore use this opportunity to call on our Royal Fathers and Chiefs and the new leadership of the Council of Obas and Chiefs to continue to address anti-social behavior in their communities. The most important ingredient for development in the State is peace and security and you all have an important role to play in this. As custodians of the culture and tradition of our people, our royal fathers should also be at the forefront of the State’s tourism campaign. A significant aspect of tourism is our culture and historical sites which fall under your jurisdiction. These must be showcased to the world and our government is channeling a lot of resources to environmental regeneration and creation of tourist hubs in the State. This project requires your support and cooperation. It is important to restate that the traditional institution of Kingship in our society, regardless of the advent of modernism, remains a rallying point for the generality of our people. It has been serving as a veritable vehicle for the dissemination of Government policies, programmes and mobilization of the populace for same and will continue to remain relevant to the government. This is why today’s occasion is very significant. 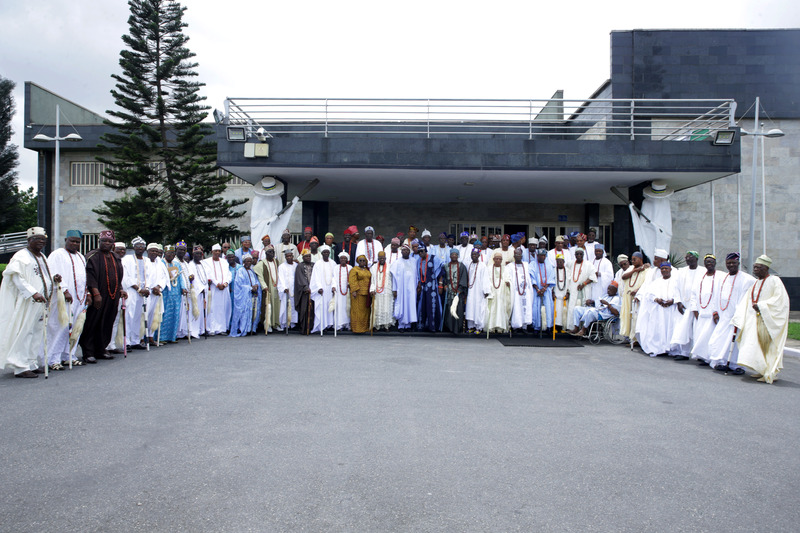 By law, the Council of Obas and Chiefs is to advise the Governor on chieftaincy matters and any other matter of public policy concerning Traditional Rulers or any other class of Chiefs. It is also to advise the Governor on matters relating to customary laws or cultural affairs, inter-communal relations and maintenance of public order in the State. The membership of the Council cuts across the Five (5) divisions of the State in acceding to the clamour for additional members and recognition. The preceding principle of equitable distribution was applied across the five (5) Divisions of the State. I urge the re-constituted Council to justify the confidence reposed in them by using their wealth of experience to support our administration in the task of deepening democracy and bringing development to every part of our State. Finally, our administration remains committed to the welfare of our Royal Fathers and will continue to support your activities as we have consistently demonstrated. Your Royal Majesties, I now have the honour to inaugurate the new members of the State Council of Obas and Chiefs and most especially the Permanent Chairman, the Oba of Lagos, His Royal Majesty Oba Riliwanu Babatunde Aremu Osuolale Akiolu 1. I wish you all a happy and successful tenure. I pray that God will grant you wisdom and good health to contribute positively to the development of our State. I thank you all for your attention. Itesiwaju Ipinle Eko lo je wa logun!